Welcome to the official discussion thread for Jack Bros. on the VB! To start, please add this game to your log, add it to your collection (if applicable), and (when you are ready) rate it using the link above! Hey, it's the Atlus game for Virtual Boy that first brought the Shin Megami Tensei series to North America! ....does anyone own this game? Have they played it? What are your thoughts on it? 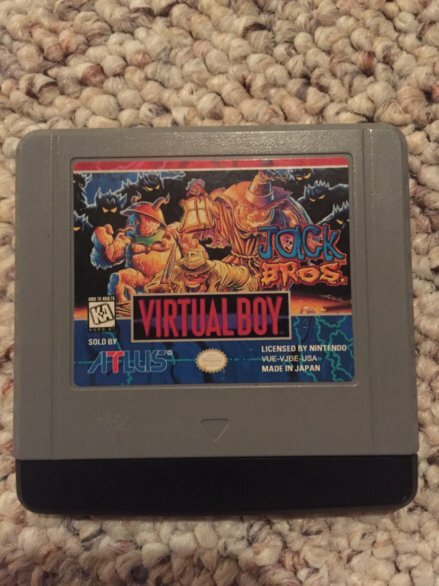 Ah, the Holy Grail of the US Virtual Boy collection! I'm still interested in purchasing this from someone if they've got one. I still gotta get this, Tetris 3D and Waterworld. Have you played this? I haven't started it yet (just got it, in fact) but I have no real idea of what kind of game it is! I still need 3D Tetris as well. That, Teleroboxer and that baseball game will complete my collection of North American Virtual Boy releases. I have to grab a non-acidified Virtual Boy Battery Pack before I start grabbing more games. Where would one even find one of those? I ran into this at a local shop and they wanted 200 bucks for it. I will never live the dream, I fear. Maybe! I haven't had much luck at gaming boutiques. That's actually pretty cheap! Especially for Canada! How long ago did you see it? About a year ago. They had Waterworld too. Complete in box. Well, can't play the game...my Virtual Boy is busted. Boots up fine, audio works...but no picture. After some research online, this is apparently a common problem for the system. Thankfully, fixing it is fairly simple and there are plenty of YouTube vids that can walk you through the process. I'm gonna try it, but I have to wait a few days for the tools I need to open the system to arrive from Amazon. Hope I can pull this off. Wish me luck! Wow, 200 for complete in box is super cheap! Considering. I got mine for $250....game only. I know Wii homebrew has a pretty good Virtual Boy emulator. Without the eye-straining, headache-inducing stereoscopic 3D, what's the point? Virtual Boy is in good, working order again! Huzzah! Awesome! My original Game Boy broke a couple years ago and I was so happy when a friend of mine fixed it up. Yeah, the price for that game is ridiculous. I was just lucky to find one (no box) for a somewhat decent price...just after getting a recent paycheck. It was such a "once-in-a-lifetime" feeling kind of chance, so I had to buy it right away. When would I ever randomly run across another copy of Jack Bros. anyway? The game itself is...eehhhhh....fun? Maybe? I dunno. It's basically a series of mazes (top-down, Zelda-style) where you have to go around finding keys and killing enemies. Once you find enough keys, you then have to get to the exit and make it to the next maze. All within a time limit. After a handful of stages, you fight a boss, then it's on to the next "world" - another set of mazes and key-finding. Rinse and repeat. It's a pretty simple game from what I can tell. And the stereoscopic 3D is made with the weakest of sauces. It's not *bad* but...it sure isn't great. IMO, anyway. This game's price is absolutely due to the fact that it is so rare. Not because the game itself is some kind of masterpiece or anything.